Back in November 2014, the helicopter descended upon the infamous Hard Rock Hotel as KISS invaded Las Vegas for an historic nine-show run. 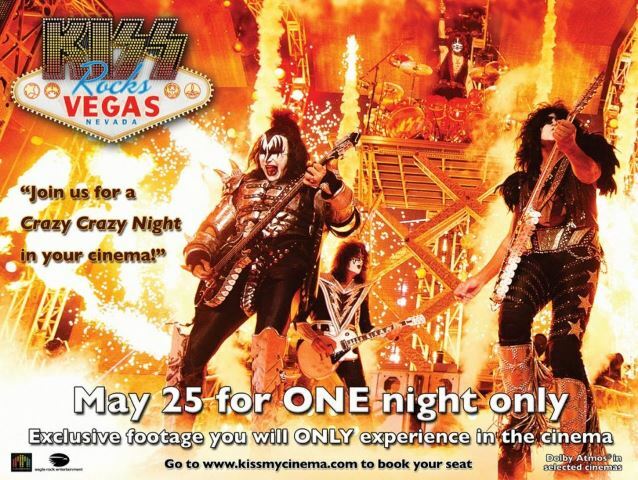 Now, for one night only on May 25, fans will be able to experience this spectacular night for themselves as "Kiss Rocks Vegas" hits cinemas across the globe. From this blistering live show, fans can expect sky high flames, ear-bursting volume and a few drops of blood! Includes exclusive interviews with band and footage you will only see in the cinema. Famed for their iconic face paint and stage attire, KISS was formed in New York City in 1973 by Paul Stanley (vocals, rhythm guitar) and Gene Simmons (vocals, bass guitar). Their sensational live performances feature fire breathing, blood-spitting, smoking guitars, shooting rockets, levitating drum kits, and pyrotechnics to spare. Tommy Thayer (lead guitar, vocals) and Eric Singer (drums, percussion, vocals) round out the band's powerful lineup. Tommy is also producer of the film "Kiss Rocks Vegas". Said Stanley: "See us on the big screen with the awesome power of Surround Sound. Feel like you are in Vegas and don't be shy to 'shout it out loud!'" Stated Thayer: "We are all tremendously proud of this production; it captures a truly unique performance. You need to see it in a cinema to get the full on experience." Said Singer: "We rocked The Joint at Hard Rock in Las Vegas. You get up close and personal with KISS. You're going to love it." 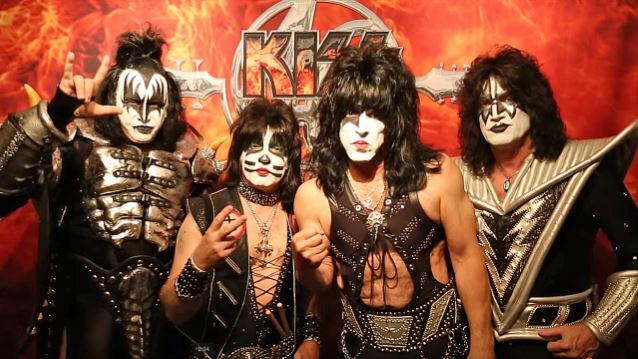 Speaking to Las Vegas Weekly, Stanley stated about how the idea for the KISS residency came about: "To spend as much time as we do in Vegas and to live as close as we do, the idea of doing a residency and leaving our stage setup, as opposed to breaking it down nightly, was really appealing." He continued: "We just finished 42 cities and played for 600,000 people, but that meant that every night the show got disassembled and moved. There’s something appealing and challenging about building a set that doesn’t have to be moved. You don't have to take into account the practicality of it, being able to be broken down constantly and reassembled. So this was something that we had wanted to do for quite a while; it was just a matter of making sure we found people who were in agreement on how to do it. The Joint was the natural place to do it."